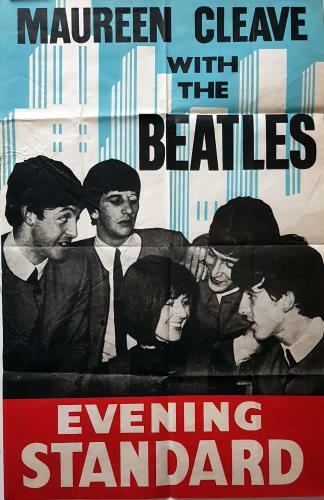 THE BEATLES Maureen Cleave with The Beatles (Rare original 1964 UK Evening Standard Poster, advertises the Beatles interview with London Evening Standard reporter Maureen Cleave. Featuring a great black & white image of the Fab Four with Maureen, above is a blue & white outline of the skyscrapers of New York, with black text across the top, and the Evening Standard red & white logo along the bottom. Measuring 12�" x 19" in size, this has been stored folded for many years, with somelight creasing, otherwise remains in an amazing condition for something made of fragile paper and almost fifty five years old. Please see more background details below). Tracklisting / Additional Info: Many speculate that she had an liaison with John Lennon, which inspired him to write the song, Norwegian Wood (This Bird Has Flown). The pair were the centre of controversy when she quoted John having said in one of her interviews published in March 1966, that �Christianity will go�We�re more popular than Jesus now. I don�t know which will go first, rock �n� roll or Christianity.� The Beatles broke up less than four years after John�s comments.